Dimensions 0.50 by 7.50 by 6.50 in. "If you want to pretend you're shrinking, that's all right," said Treehorn's mother, "as long as you don't do it at the table." But Treehorn wasn't pretending. He really was shrinking. Hilarious complications result as he becomes more minuscule by the moment. 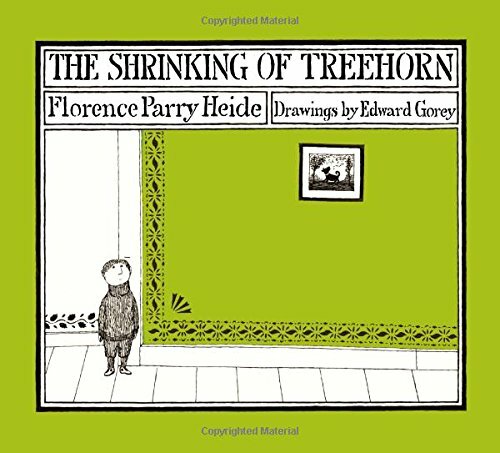 Treehorn is a bit downhearted when his teacher says, "we don't shrink in this class," and sends him to the principal. Poor Treehorn spends an unhappy day and night until he discovers a magical game that restores him to his natural size. This is a great relief to Treehorn before he notices that he is turning faintly green. . . .
About: "If you want to pretend you're shrinking, that's all right," said Treehorn's mother, "as long as you don't do it at the table. With Edward Gorey (other contributor) | Reprint edition from Holiday House (September 1, 1992); titled "The Shrinking of Treehorn"
About: A boy discovers he is shrinking but does not know the cause or cure. With Edward Gorey (other contributor) | from Holiday House (June 1, 1971); titled "The Shrinking of Treehorn"